Jack: Hell, everyone. Jack Bosch here with “The Forever Cash Life Real Estate Podcast,” where we talk about land flipping, about related techniques in the real estate space but more than anything about techniques that you can do with very little competition, with cash and cash flow from at home, and so on. So, our guest today is Aaron Williams. Before we introduce him today, which I will do just after a little break, I am first wanting to give you…as always want to make sure you give us a five-star review. You press the review button. You leave us a little review if you’re watching this on YouTube, put the thumbs up, share this with your friends because the more people you share it with, the more people we can reach this message of real estate investing without any tenants, toilets, termites, without any houses. And our guest today, Aaron Williams, is a land flipper in our Hall of Fame and he’s doing some tremendous deal. So, let’s get started in just one second right after this. Announcer: Welcome to “The Forever Cash Life Real Estate Investing Podcast” with your hosts Jack and Michelle Bosch. Together, let’s uncover the secrets to building true wealth through real estate and living a purpose-driven life. Jack: Okay. So, we’re back. Aaron, welcome to the show. Aaron: Thanks for having me, Jack. Jack: All right. Well, I’m excited. So, Aaron, give us a little bit an update about you, like an overview about you. Who are you, where you’re from, how long have you been in real estate? What do you do? Just give us a quick rundown about who is Aaron Williams. 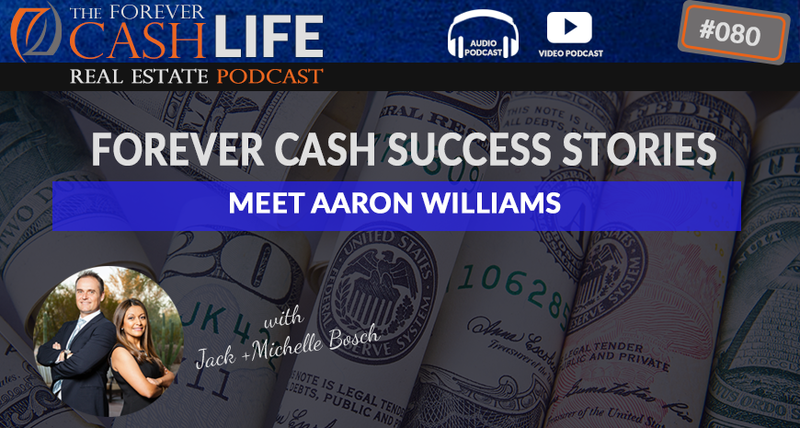 Aaron: I started real estate probably when I was 21, 22 and I started wholesaling properties, just putting them on a contract and selling them. And I did that for a few years and then I got to a point where in ’06, ’07 when the market came out, I wasn’t able to wholesale anymore because my offers were higher than the loan amounts. So, I kinda didn’t know what to do. So, what I did was is I kept searching, searching, searching, and that’s when I came across land. And what attracted me to it was, most people didn’t owe any money on the property. So, it was like a bell that went in my head and I said, “Gee, I could still keep wholesaling because these people don’t have any loans against their property with a majority of them.” And that’s kinda why I started this. I did go into the lease options and taking over deeds and all that, but I actually really liked wholesaling. So, this is one of the things that attract me to it. So, probably I did a couple of land deals, but for some reason, I got into Amazon and eBay and I do that full time. And for some reason, I just woke up and I said, “Why am I not doing the land stuff anymore?” So, I signed up with the coaching program and I said, I’m going to make a commitment and I’m going to put my foot down and just do it. And it’s just something I’ve wanted to do for some time now. Jack: So, this is awesome. So, you started being successful in real estate. You got hit by the 2007 crash and basically wiped out or almost wiped out or not wiped out, but like no more deals. Aaron: There’s nothing really to wipe out. The good thing is, I guess when you’re wholesaling, you know, you’re not taking any debt or anything. So, I just didn’t make any money. I went from making money to just making no money. So, I guess, the good news is I didn’t take on any personal guarantee debt. I didn’t promise to take over a lot of people’s payments when I was wholesaling. So, I just went from making good money to making zero. Jack: All right. And by the way, that’s one of the examples of what can happen if you just wholesale. So, if anyone has not read the book that Michelle and I wrote called “Forever Cash,” you can actually get it on the forevercashbook.net, again, forevercashbook.net, you can get the copy of that book for just like shipping and handling. We only have like, I think 1000 or so left, then we’re completely sold out. It’s out of print. On Amazon you can get it too, but only in the secondary market. But bottom line is that’s when…So, you started seeing…you started doing another business, we’ll talk about that in a second, but then you started asking why I’m not continue doing land. So, you’re doing wholesale land and you’re also doing anything to provide cash flow in your life. Aaron: Well, when I couldn’t wholesale properties anymore, I think what happened was, is my expenses were just eating all my cash. So, I actually went back to selling cars for about a year or two and then I started doing Amazon and eBay, which I did great at because nobody was really doing it in ’07, ’08, ’09. No one even knew Amazon like it is today. So, I did pretty well. And then Amazon got very competitive. It’s extremely competitive now because there’s a lot of people doing it. And then I said, I just had good success with the land stuff. I did a couple of deals and then I just stopped. I don’t know why. And then one day as Amazon’s getting tougher and tougher because there’s over 1 million sellers now on Amazon. Aaron: I said, “How come I’m not doing the land stuff?” I saw a big opportunity and I liked how you could do the seller financing and stuff like that. So, you know, it just piqued my interest. And I think the long-term potential is a lot more than Amazon because Amazon has so many rules and regulations now. It’s not difficult, you can still jump through the hoops, but it’s just easier where you’re building a business around yourself as opposed to another business. You know, sometimes, you know, the rules can get kind of crazy and sometimes it’s not worth it anymore. Jack: …as a business. But really you are a salesperson for an organization and you build your own sales team, but if they change the compensation a little bit, boom, all of a sudden, you might lose half of your compensation because it’s not your business, right? It’s somebody else’s business. And it’s the same with Amazon. You can sell anything on there, but if they change the rules, if they change even the algorithm, you go from page 1 to page 27, your sales go from top to bottom. Am I right on those things? Aaron: Well, what I liked about going the real estate route is the only person that could change is maybe the government. And if they change it, you gotta change anyways. But when you’re doing a business around another business and they say, “Oh, you’re selling Nike, well that’s great.” Well tomorrow they say, well, you know, Nike says, “Hey, we don’t want you to sell on Amazon anymore because you don’t buy from us directly.” While you might have $50,000 in Nike and inventory that you’ve invested in, now you’ve got to either take a hit, or trying to sell it somewhere else, or there’s like a lot of hoops you have to jump and I think that’s one of the biggest things that I liked about the land business or just the real estate business in general is, you’re just buying, and selling, and you’re just doing your own thing. And no one’s really there to say, “Hey, you can only do so many or you can’t buy in this neighborhood or you can’t buy in this area.” So, you’re kind of free to kind of maneuver like you want to do it. You can sell for whatever you want to sell as long as the other guy wants to buy it. And it’s just a little bit more freedom. You know, when you are limited to what someone else says, it scares me the scale up my Amazon business because they can say, “Hey, some 24-year-old kid buying a computer, I don’t like what he’s doing today. We’re shutting down for a couple of weeks.” So, that’s one of the reasons why I started looking at other directions. I do really well on Amazon. You know, I just don’t like the direction they’re going because of the rules and regulations. So, that’s why I started looking at the land business altogether because you can kind of do what you want to do to a point. Aaron: Yeah. I guess that can happen too in the land world. But at least if you’re advertised on eight different sources and one source dries up, it’s not the end of the world. Jack: Yeah, exactly. So, in the land world, we have had to switch channels over time. So, as you know, back 2005, 2006, 2007, we did big land auctions. While the market changed, the land auctions wouldn’t work anymore, but the online worked. But back then online meant that you go on the online newspaper, you advertise perhaps in a regional newspaper set, where you put an ad into physical newspapers, where we went onto Craigslist, which still works today, where we went down to…And now there’s so many other options out there that you can use. But now let’s talk about, how have you done since you switched over to the land side of things again? Aaron: Well, today I’ve done about 30 deals. Jack: All right. In how much time? What time frame? Aaron: It’s funny because I just had my numbers out just a second ago. I did about three deals, believe it or not before I really got going. It was in 2012 and 2013. I did three deals just using the course. And then when I wanted to get serious, I think my first deal was probably July of 2017, up till now I’ve done, you know, the rest of those deals. Jack: So, that’s about the time period from July till now, it’s about 18 or 19 months. Jack: So, 18, 19 months to 30 deals, that’s basically you may be doing like you’re ramping up to about one-and-a-half to two deals a month. Right? Jack: Yeah. It’s not like you’re doing it full time. Aaron: …24 hours a day. Jack: Well, 30 deals part-time in 19 months is pretty good I would think, right? Aaron: No, it’s pretty good. Jack: Now, here’s a bit of fresh bigger question. I understand from our pre-conversations and we know each other, you’ve been to our events, that the first deals were tended to be smaller deals, right? But now you have transitioned to the higher ideals. Tell us about that a little. Aaron: Well, the first couple of deals I did where, I’m looking at them now, I was buying them for 2,000 bucks, selling them for 6,000 bucks. I bought one for 1,500, I sold it for 6,300. I bought one for [crosstalk 00:11:56]. Jack: Well, that’s like $4,000 to $5,000 profits. Jack: No, not at the higher price ranges. Yes. Aaron: I think after about 15,000 letters I sent out, and I don’t know why I sent out so many of them, I said to myself, “Gee, I think I have to come back to realization.” And that’s one of the reasons why I signed up with the coaching program and I wanted to be part of the coaching group, I mean the Facebook group, just to talk to other people that were doing the stuff. Because I always do massive action. But sometimes if you do too much massive action you get no results, you have to think about what you’re doing. Jack: Absolutely. So, you sent out 15,000 letters and you didn’t get any results because those 15,000 letters were sent out to higher price properties at 10% offers. Aaron: I kind of went a little crazy. Jack: Yes. So, now there’s a part in our course, Aaron, you know that, right? That says that, “The higher the value, the higher the offer.” Right? As a percentage-wise, you might’ve overlooked that part. Aaron: I probably did, but I’m kind of a little crazy at times where I’ll say, “Yup, let’s just give it a go and hit the button in. Who cares?” And I went a little crazy, to be honest with you. I mean, I sent letters out to…I know your course said to send them out between 10,000 and…I think it was 5,000 to 80,000. I went a little crazy because I thought it was a know-it-all and I went for the 200 to 500,000. Jack: Okay. All right. And you probably would have gotten some if you would have offered like 25%, 30%, 40% of market value, which by the way you can still do. Jack: You can literally go back to the people that have called you on those letters and make them a higher offer today. And even though that has been a year or two ago, you can still get deals from that today because guess how many other people are in that market and sending those guys letters? Jack: Nobody. And that’s the beauty of this. Like, you know, Kasey and Courtney, they’re in our mentorship program, are in our Ultimate Boardroom Mastermind. And they were on this show I think just a couple of weeks ago. I just interviewed them, I don’t know exactly what’s the sequence they might be, but they might be brought on just a week or two before you. But they have done something like that. They sent out a bunch of letters, got a bunch of offer requests. They were so scared of the system. They never even made offers and waited half a year to make offers. And then they made offers and they still got deals accepted because how many people are also doing this? Zero, right? Nobody else’s writing to these people. So, here’s just something, if you take that from this call, go back to those and still make them a new 30%, 40% offer on the deal and you’ll get some accepted. Well, then I went back to look at the comps. Now that I have a contract back in my hand about a week later and I figure out the thing’s only worth 50 grand. But it was all because of that massive action that got me to get going. So, you know, I didn’t really want to call him back to make him a lower offer, but I made him an offer for 7,500. And I don’t know. I think it was bent out of shape because come to find out the property was on the market for two years. So, he didn’t want it, and he actually accepted my offer, and then I sold it to the neighbor about a week later. I have to look at my numbers, but that one, I think I sold for about 40 to the next door neighbor. Jack: So, the same guy that wanted 35,000, now accepted 7,500? Jack: Without any additional explanation? Aaron: I thought he was going to tell me, “Let me get back to you. Let me talk to my wife. Let me whatever.” But I literally started the title work and then right before I closed on it, I did the math and I looked at it and I said, “Whoa, this thing’s not worth 100 grand.” Because I made an accident when I initially looked at it, I was comparing 10-acre properties to 10-acre properties in the area, but I wasn’t comparing it to what was going on in that subdivision. And that specific subdivision, the values were different than the properties that I was comparing it to outside that subdivision. So, I went back to him and I just told him, “You know, all I could do is 7,500.” And the guy, 30 seconds later says, “Okay, let’s do it. You’re going to get it done this week.” “Oh, I’m ready to go.” And that was it. Jack: And you sold it at 40? Aaron: Yeah. Sent a letter to the next door neighbor. It was weird because the next door neighbor, it was four parcels put together that equated 10 acres and then the next door neighbor wanted, you know, two of the properties out of the four. So I, you know, jacked the price up a little bit since he didn’t want all four. And he says, “You know, I just figured I’ll take all four.” And you know, a week later, 10 days later, we’re closing. And it’s funny because I closed on it, called the realtor who listed it, and that listing had expired. I said, “Hey, will you list the property?” Because it wasn’t a gated subdivision and I needed to list it to get people in there. And she said, “Oh, there’s no way I’ll ever list that property. It’s been listed for two years. Nobody wants to buy it. You know, I’ve showed it like I don’t know how many times.” I don’t know, she just had a bad taste about it. I just get the feeling that she kind of maybe give that to the people that she was showing it to. So, I’d never listed it. Jack: I love this man. I love this. I mean, first of all, this is such an exemplary example of what can happen with the land flipping business. Like it’s right in front of the realtor. All the realtor needs to do is figure out that neighbor’s address or do exactly that. But realtors don’t thank out of the box, most of them at least don’t. They don’t think out of the box. They don’t think creatively. Their listings usually are horrible. So, you created probably…did you even create a listing in this case? Aaron: Actually, what I did was with the neighborhood letter, I go to Staples and I actually take a screenshot of the aerial view of the property with arrows point at the property, you know, from the tax assessor’s map. And I kind of on the backside of that, I just put, you know, a little flyer. You know, I think it’s worth this, I’m willing to sell it for this, you know, kind of thing with the terms if they want to own the finance or if they want to pay cash. You know, and that’s all I really did. So, I actually never created a listing for that property. But I had it in a flyer. Jack: Even more beautiful. So, that’s exciting. Then you made like what, net, $30,000 on that deal. Aaron: Yeah, in a week, 10 days. Jack: Very nice. In a week? Loving it. So, this is such a great example that most people overlook. They go out, they put the elaborate listings, and things like that on there. And the first thing you want to do is you want to contact the neighbors around the property. Right. We sold a property that has actually same exact scenario, we thought the property is worth like 100, then we find out it’s in a gated custom home development, we figured 150, then we dig into deeper. We see there’s a big kind of wash going through it. Like, when it rains, the water flows through it. So, you can’t really use it for much. But we only had it in the contract I think for 12,500. Now we go, we’re just like, “Darn, now what do we do?” And so, well, the logical thing, go to the neighbor. Guess what? The neighbor bought it for 25,000 the next day. Jack: The neighbor doesn’t want to put another house on there. The neighbor, in this case, wanted to just have an expanded backyard, wanted to have another acre. Aaron: Yeah. I mean, for the people who are watching, the biggest takeaway, for me, on a lot of this stuff is, there’s people out there that want these things that you wouldn’t think would normally want it because the neighbors, they buy the stuff, I don’t know if it’s half the time, but maybe it’s 30%, 40%. I mean, I’ve had countless times, where it’s been listed with a realtor, you send the neighbor a letter, and they usually…you know, not usually, but maybe 30%, 40% of the time if it’s a good deal, and especially if you’re going to give them terms, where they don’t have to come up with all the money, there’s just no other reason for them not to do it. It’s just going to increase the value of that property regardless. Aaron: I think that one was probably worth 50 or 60, but that was all said and done, I sold it for 40. So, it was a decent deal, you know. Jack: Yeah. And even sometimes, I mean, a typical deal, when you’re buying for 20 cents on a dollar, even if you sell it at half price, they’re literally increasing the value of the property by the market value of it. But they’re getting it for half price. Now they’re expanding, they’re making their property more desirable because it has a bigger backyard than anyone else. They also have the side benefit of not having a neighbor staring into their window, right, which makes the property more attractive. So, all these different things are done such that they have more privacy, they have more peace, they have more space. And when they go sell the property, they get a better price for it. So, it’s a beautiful combination. Or do want to build another house on it…Go ahead. Aaron: The other thing too is, one of the properties that I bought, the owner told me it was useless. And I said, “Well, why is it useless?” He said, “Well, it doesn’t pass the perc test, so I can’t put anything on it.” I mean, that was a perfect one for the neighbor because one, I got it for next to nothing. But two, the neighbor doesn’t care if it passed perc test. Jack: Because they don’t want to build a house on it. Jack: They want to put a playground for the kids on it. Jack: Right? That’s exactly the thing. That people don’t think out of the box. So, love it. So, now though, let’s move on to just one other aspect, which is, now you’re doing more higher-end deals. So, what has been your best deal that you’ve done? Aaron: I’ve done a couple of $60,000 deals. Let’s see, looking at my numbers, where I bought them for like 20, sold them for like 80, a couple of those. I haven’t got over the $100,000 mark yet. There’s a couple of them I’m working on right now. Aaron: But I think for me, a lot of wasted time…it’s not really wasted time, you know, but for me, it was a lot of offers I sent out, a lot of research that I put into it, where I didn’t know any better and I’m sending out those 10%, 20% offer. Like, I think for those higher-end ones you need to go to the 40. Like, I got one on the contract right now for a buck 30. I actually have it sold for 200. I think that one’s worth 300, 350. I don’t even know. You do run into other challenges that the other ones you don’t run into. Like this one, the survey is going to cost crazy money, but the sale is going to do it. But there’s other issues that you do run across with the little ones. I think the sellers don’t really care as much. The higher-end ones, you’re dealing with a different person. They’re a little bit more intellectual. You know, sometimes they want some down payment money out of you. I don’t know. I mean, it’s a little different kind of people you’re dealing with. I think they’re a little bit more sophisticated. They start asking a few more questions, but you still get the deals done. But they just want to know you’re real, I guess. I don’t know. Jack: Yeah. But you said something very interesting that I just want to hinge in for a little bit. You don’t even know if that property that you put on the contract for 130 that you’re selling for 200 is worth 300, or 350, or 400 than what it’s worth. Aaron: Yeah, I don’t know. Jack: Isn’t that a beautiful thing, that in our…like if you don’t know exactly what a house worth is, if you compared it to the household selling side if you were 10% off on your house value, you probably destroyed your deal. Right? Aaron: Well, the margins are tighter. That’s why you destroy the deal. Aaron: But I think what happens is, when you go after these other properties, you spend more time trying to figure out what they’re worth because there’s not a lot of them out there like that. Like, if you’re in a subdivision where lots are selling for 300 grand, and you’re trying to get those comps, sometimes you got to go back two, three years, you don’t really know because two, three years ago was a different market. Even though there’s, you know, 60, 70 lots in that subdivision that probably a house is already on, sometimes you got to guess a little bit, but I don’t know. You just run into different things. The lower-end is very easy to find values because there’s so many of them around. The higher-end, you got to guess a little bit sometimes. Jack: The part that I’m getting to though is some of the parts that I like most about the land flipping is that you don’t have to figure out the exact value. Jack: So if you’re making a 40% offer on this case or 30%, 40% offer, you have so much buffer space and there’s so much margin that even if you’re off by 100 grand, you’re still gonna make $50,000 on a deal. Aaron: Yeah. You’ll make something. I mean, I probably broke even…actually, I didn’t even break-even. I had one deal I made like 600 bucks on. I had thought it was worth…I don’t know. I probably thought it was worth 30 grand, but come to find out, it was on the side of a cliff. Jack: Okay. Good view, so to say, right? Aaron: Well, it’s funny, like every person that looked at it, just didn’t want it. It was literally like 80% on an angle. That’s how I learned how to use Google 3D Earth. Jack: Yeah. Absolutely. Yeah. That’s good tool to use. Aaron: Even if you’re wrong, you can get something out of something, I mean. Jack: So, a lot of our students have an issue transitioning from lower-priced properties to higher-priced properties. Either they come in to us already with the mindset and with the attitude like, “I’m going to do the $200,000 deals” or they’re coming in with the attitude of like, “Let me make a deal and make me like 3 grand because it’s a motivation booster, it’s a confidence booster, and so on, and so forth.” You came in at the $4,000 to $5,000 deals and now you’re doing $60,000 and $80,000 deals or $40,000 to $60,000 deals. Aaron: Well, I think my mindset was a little different going in because I’m already running an Amazon, eBay business already making money with it. So, like, it’s cool to do those deals, but it’s like you got to make your mind up. Am I going to do the volume or am I going to do the other deals? So, to me, it’s just a mindset thing because you know, it’s just because of what I’m already doing. And when I was wholesaling properties, I was already making 20 grand a deal on a wholesale deal and I’m doing one, two, three, four or five a month. So, I got the mindset already. Just I need the opportunity, I need the vehicle to do it with. That’s really the key. Jack: Opportunity and the vehicle. Yes. So, great. That’s a good point. So, you are one of the guys that already came in with the right attitude…not the right attitude, with a confidence level that a $40,000 deal, a $80,000 deal is just something you’ll feel comfortable with. Now, what would you tell somebody who has….perhaps doesn’t have that confidence level? Or perhaps, was there a time in your life when you didn’t have that confidence level? So, what would you tell somebody who is like starting out right now? What is the difference between a $4,000 deal and an $80,000 deal, other than the sellers are a little bit more sophisticated? Aaron: Well, I mean, at the end of the day…You know, I was talking to a couple of other guys and I says…And they’re not even closing on these things. They’re just double closing, doing assignments. They’re not even closing on them. I’m like, “Well, if you’re not going to close on it, who cares? What’s the difference?” The mail is going to cost the same thing. I mean, the risk is the same. If you’re not going to close on it, you’re not going to lose anything. So, what’s the difference of sending it to this neighborhood instead of that neighborhood? Instead of tax assessed at this, why not tax assessed at that? So, if the mail is going to cost the same, why not? Aaron: I mean, it’s real no. Jack: So, would you say people overcomplicate things and overthink it? Aaron: Yeah, maybe it’s because they don’t want to talk to a guy that has a 200-acre property, I guess. I don’t know. To me, it’s like…I don’t even know what a 200 property looks like. I’ve never even been to one, but maybe it’s different. I don’t really know. I think the deals get done easier. I don’t know. I really don’t know. Aaron: But you got these scaredy-cats though, like some of these sellers when they’re buying these $10,000 properties it’s probably the last 10,000 bucks that they have. So, they’ll sit there and ask you a billion questions or ask you about the finance and all that. One of my mindsets going in was, is I wanted to do the seller financing at the higher-end, but what I found out is most of them pay cash. So, I guess, to do seller financing I’m going to have to go back down to the lower-end or stick to the bigger deals, that’s what I’m going to get. I don’t know. Jack: Yeah. That’s an interesting thing. I keep telling people like the lower-end deals…I just spoke at a convention in Florida last week and the people ask me like, “What price point is like?” “Well, it depends on your comfort level. It depends on what you want to do. But let me tell you that the higher price properties sell quicker and they sell for cash.” And they’re like, “Oh, okay.” People that buy $3,000 properties unfortunately often need financing because they don’t even have the $3,000. And their mindset is not oriented towards a $100,000 property. So, their financial thermometer, their financial comfort level is not at $100,000 level. It’s at the $3,000 level. In other words, they’re living paycheck to paycheck and they can’t afford even a $3,000 payment for one lot. So, it’s truly all…at the end of the day, it’s all a mindset thing. Where you are in life right now is a matter of your own internal mindset. Aaron: Well, it’s funny because the few deals that I have owner financing now, I didn’t even know it, but I have a company that I use called Madison Management and they literally will send you spreadsheets of all these people who they have to chase to make those payments. I didn’t even know they chase them. I gave them all the contact information for his email, and phone number, and all this other stuff, but they literally every month have to chase these people. Not everybody, but some of them, they have to chase them to get the payments made. And I didn’t even know it, but after 30 days, I think the bill goes to $95 a month instead of $20 a month. And I called them, I said, “Why is my bill $95 a month?” “Well, we have to call these people every day and email them every day. So, if it’s a nonperforming loan, the bill goes to $95 a month instead of the $20 a month.” But they end up getting the money. So, you know, it’s pretty interesting. Because you know, the lower-end deals, they still have to chase the people for the payments. It’s not over yet. And it’s like a job in itself. But with the right escrow company set up, like these people will chase them. Jack: So, great. So, then I have just one last or a couple of last questions that is like, so what do you do? Do you do anything? Do you have like a rhythm for your day that keeps you motivated, and keeps you going, you know, or is it just internalized over the years? What does Aaron do to keep the things going with all the different things that you do? Aaron: Well, I got my little board up here. And, you know, I got my…I don’t want to make it fall. I got my board up here of all the things that I’m supposed to do. It just stares at me. And you know, all my goals and stuff are on my board. So, literally every morning I’m looking at it and I’m saying, “Oh, okay, that’s what I’m supposed to be working on.” Because you know, after a while your bills are paid, but you got to work on other things. So, I look at that stuff every day, and that’s my focus, and that’s kind of what I have to work on. And right now I’m working on an accountability sheet and I have to get it done. And if I don’t get it done, then I need to get help to get it done, which is I’m kind of working on. And that’s it. Aaron: You know, it’s just like [crosstalk 00:35:43]. Jack: Yeah. So, the message here I think is that no matter where you are in life, even if your bills are paid, you still got to work on your own motivation. And I do the same thing, I do vision boards. I do weekly, Sunday night, I sit down, okay, my plans, and my goals, and my things for the week, and my reason why. And then I keep reminding myself of the reasons why, and to go, to keep doing things. Even though financially you might not have to, you could take a few weeks off or the few weeks could turn it into a few months, turn it into a few years, which is nothing wrong with that. But in life, you either grow or you falter. Right? So, I’m all in favor of growing. Right, with that, Aaron, thank you very much for being on the call with us, for being on the podcast. Jack: Really enjoyed it. Thanks a lot for sharing your transition here, and your process, and some of your deals, and your struggles also on some of those deals, and your mindset, I really loved it. So, with that everyone, if you enjoyed this, go again, if you’re listening to this on iTunes, go give us a five-star review, and leave also a comment on there. Because the more comments we have, the more feedback we have, the more reviews we have, the more we can spread the word about this low to no competition technique of land flipping that works just like house flipping just without the houses. And if you’re watching this on YouTube, then again, put the thumbs up, share it with your friends, post it on Facebook, share it around. And then with that, thank you very much, Aaron.